How Far Along: 31 weeks. Holy crap. I am in the single digits for weeks remaining. Size of baby: Baby Rudiger is now16 inches long and about 3.3 pounds now. Baby Rudiger is now being compared to four navel oranges. Umm okay. Gender: Baby Rudiger is a boy! Movement: Oh yes. A lot. All the time. Especially in the evening while working on my computer. How I'm Changing: The heartburn for these past few days has been horrible. The Dr suggested taking pepcid AC which is not helping. Total Weight Gain/Loss: Up 28ish lbs at last weeks Dr's appointment. Ugh! 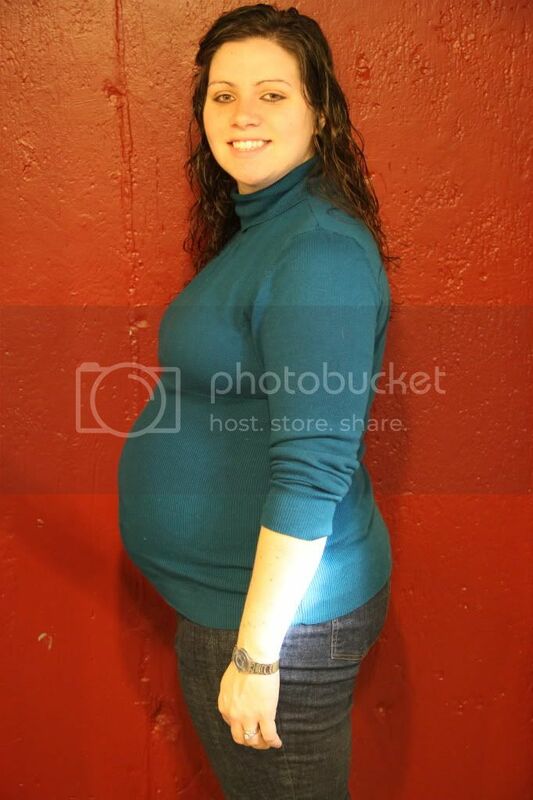 Maternity Clothes: Of course. This weekend I have been wearing my old t-shirts and my belly is constantly hanging out. How I'm Feeling: The charlie horses have been increasing as has my lower back pain. Sleep: Besides waking up to weird dreams, charlie horses and because I have to pee a couple times each night... it is sleep. What I miss: My appetite. What I'm Eating: Random things here and there. Still not really making or eating dinner.